3 bedroom connecting villas with pools is a pair adjacent of 1 and 2 bedrooms villas: the 1-bedroom has a private pool with twin sun-loungers and loveseat, air-conditioned king-sized bedroom and dining area, oversized indoor-outdoor bathroom and kitchen; while the huge 2-bedroom villa features a private pool, four sun-loungers, poolside balé, open-air living, dining and entertainment space, air-conditioning in two king-sized suites and media room, guest loo, kitchen with staff entrance and extensive gardens. A discrete doorway in their gardens connects these two villas to create a large 3-bedroom estate for families or groups. Villa 5 is a perfectly proportioned one-bedroom villa. Outside, a large, open-air seating area with a teak wooden deck overlooks verdant gardens framed by blooming Frangipanis and a sparkling swimming pool. Guests can lounge on poolside sunbeds or lounge on the villa deck in the shade on a king-sized day bed. Indoors, everything you could ever need is tastefully and harmoniously designed with authentic Balinese style; the furniture is upholstered in natural fabrics and a super-luxurious king-sized bed has views out over the pool. 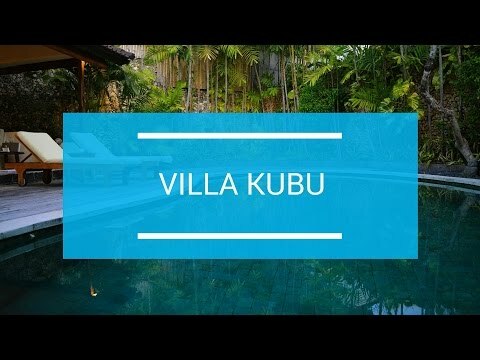 Villa 6 sits right at the front of Kubu and is our most requested residence. This two-bed villa is perfect for guests seeking privacy at night and the luxury of space during the day. The lush, private, walled gardens host a free-form pool, traditional thatched balé, a series of Koi-filled water features, hand-carved Balinese sculptures and a palette of floral delights in the expansive gardens such as Heliconias, Bougainvillea and blossoming Frangipani. Three stand-alone buildings house two luxurious bedroom suites with vastbathrooms; while a third pavilion has a huge, light-filled, open-plan living and dining area, plus a large air-conditioned media room with flat screen TV and DVD, leading to a full-sized kitchen with its own separate entrance, perfect for when you summon our staff to cater for your dinner or cocktail soirees.